The Antarctic is in some ways the precise opposite of the Arctic. The Arctic is an ocean basin surrounded by land, which means that the sea ice is corralled in the coldest, darkest part of the Northern Hemisphere. The Antarctic is land surrounded by ocean. Whereas Northern Hemisphere sea ice can extend to roughly 40 degrees north, Southern Hemisphere sea ice can extend to roughly 50 degrees south. Moreover, Antarctic sea ice does not extend southward to the pole; it can only fringe the continent. Antarctic September Extents, 1979-2009. Image by Matt Savoie, National Snow and Ice Data Center, University of Colorado, Boulder, using SSM/I data overlaid onto the NASA Blue Marble. 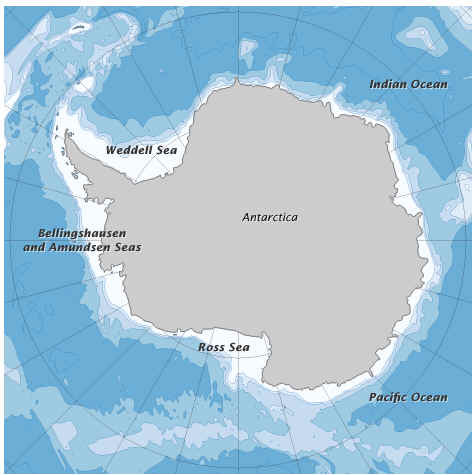 Antarctic sea ice is distributed around the entire fringe of the continent—a much broader area than the Arctic—and it is exposed to a broader range of land, ocean, and atmospheric influences. Because of the geographic and climatic diversity, Antarctic sea ice is more variable from year to year than Arctic sea ice. In addition, climate oscillations don’t affect ice in all sectors the same way, so it is more difficult to generalize the influence of climate patterns to the entire Southern Hemisphere ice pack. As in the Arctic, the interaction of natural cycles is complex, and researchers continue to study how these forces work together to control the Antarctic sea ice extent. A study on warming of West Antarctica since the 1957 geophysical year correlates widespread warming in West Antarctica and sea ice decline. Whether sea ice decline has led to warming temperatures on the continent, or whether both phenomena are caused by something else is not currently known. One concern related to potential Antarctic sea ice loss is that sea ice may stabilize Antarctic ice shelves. Ice shelves are slabs of ice that partly rest on land and partly float. Ice shelves frequently calve icebergs, and this is a natural process, not necessarily a sign of climate change. But the rapid disintegration and retreat of an ice shelf (such as the collapse of the Larsen B shelf in 2001) is a warming signal. Although sea ice is too thin to physically buttress an ice shelf, intact sea ice may preserve cool conditions that stabilize an ice shelf because air currents passing over sea ice are cooler than air currents passing over open ocean. Sea ice may also suppress ocean waves that would otherwise flex the shelf and speed ice shelf breakup. The interaction between sea ice loss and ice shelf retreat merits careful study because many ice shelves are fed by glaciers. When an ice shelf disintegrates, the glacier feeding it often accelerates. Because glacier acceleration introduces a new ice mass into the ocean, it can raise ocean level. So while sea ice melt does not directly lead to sea level rise, it could contribute to other processes that do, both in the Arctic and the Antarctic. Glacier acceleration has already been observed on the Antarctic Peninsula, although the accelerating glaciers in that region have so far had a negligible effect on ocean level.